I had visited The Hispanic Society of America Museum and Library in New York City several times before, but never to see a contemporary art exhibition. It was a wonderful surprise to learn that this fall Dia Art Foundation is collaborating with the Hispanic Society to present the exhibition Fabiola, an ongoing, collection-based art project by Francis Alÿs, curated by Lynne Cooke. This exhibition inaugurates the first of a three-year collaboration between Dia and the Hispanic Society. The Hispanic Society opened its doors to public in 1908 in a Beaux-Arts style building complex in New York City’s Washington Heights neighborhood and originally housed Archer Milton Huntington’s collection of art and artifacts from Spain, Portugal and Latin America, varying from textiles and paintings to incunabulum and prints; since its opening, the collection has grown. The place is known as Audubon Terrace after famed painter and naturalist John James Audubon, whose farmland was partly sited on that block. Today the site of three educational and cultural institutions, this building complex is a neighborhood gem, and the Hispanic Society a notable, yet overlooked, cultural institution in New York City. Currently, the Dia is presenting an exhibition of almost 300 portraits depicting the Christian Roman Saint Fabiola in one of the Hispanic Society’s galleries traditionally devoted to its collection of nineteenth century paintings. According to Cooke, the portraits are rendered after one 1885 portrait attributed to the French academic painter Jean-Jacques Henner. Paintings on canvas or wood, small embroideries and other types of portraiture, all these Fabiolas have been collected by Alÿs since the early 1990s in flea markets and shops throughout the world, and, most recently, through informal bequests by his colleagues and friends. Fabiola, a collecting and installation project by Alÿs had been exhibited before, but never at this scale. The first time was in 1994 in an exhibition curated by Cuauhtemoc Medina at a now defunct independent art gallery in Mexico City called Curare Espacio Crítico para las Artes, a space affiliated with the still-published art journal of the same name. While Medina had written once before about Alÿs’ work, the 1994 exhibition was their first together — today he is arguably Alÿs’ closest collaborator. Fabiola is not the first time that Alÿs works with a collection, nor is this the first time that the artist proposes, in New York, a site other than the white cube for his work. In an earlier project in New York City, Alÿs proposed taking the art into the streets with his performance The Modern Procession (2002), commissioned by the Public Art Fund in collaboration with the Museum of Modern Art in New York. “I wanted to put art in motion. … to get away from the unavoidable hygienic, safe conditioning which the ‘white cube’ provides.” (Alÿs cited by Roselee Goldberg in Francis Alys: Marking Time in The Modern Procession, New York: Public Art Fund, 102). […] Alÿs sent some sixty Fabiolas to an exhibition [the 2nd Biennial of Saarema] in Saaarema, Estonia, in 1997. When the works were shipped back to him, he discovered that almost thirty had been replaced with substitutes, crude versions made to simulate his “originals,” which had mysteriously disappeared en route. Wishing to conceal rather than acknowledge that they had lost or otherwise appropriates his works, the Estonian organizers seemingly hoped to fool him into believing that the substitutes—the copies they commissioned of his copies—were not fakes but works he himself had collected. 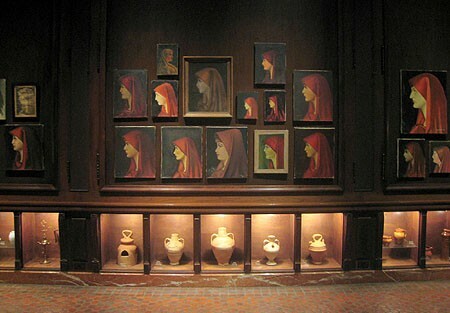 Francis Alÿs’ Fabiola will be on view at the Hispanic Society from September 20, 2007 to April 6, 2008.